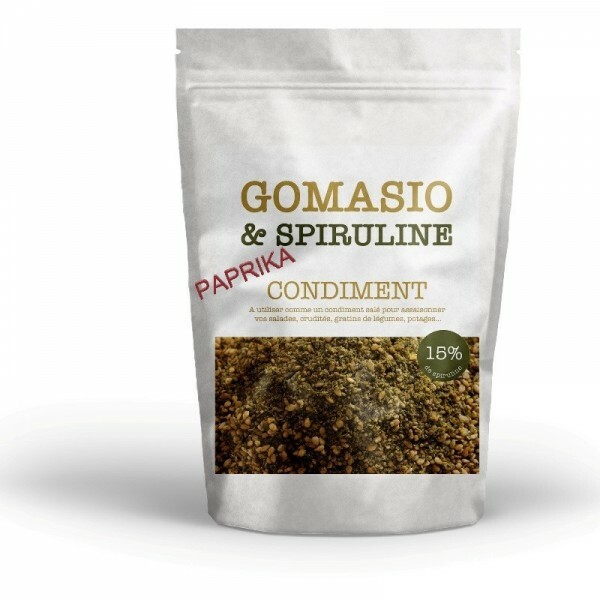 The gomasio with spirulina and paprika is a preparation made from grilled sesame, spirulina, sea salt and paprika used as a substitute for salt to enhance and enhance your dishes. By buying this product you can collect up to 11 loyalty points. Your cart will total 11 points that can be converted into a voucher of 0,22 €. Use gomasio with spirulina and paprika instead of table salt. Here is a version that develops quite different flavors with the addition of spirulina and paprika. Paprika has good digestive properties. Its high vitamin C content makes it an ally against winter. To cross the winter, adopt spirulina to boost your preparations of salad dressings, vegetable juices, smoothies. * Products from organic agriculture. Allergens : Sesame. Possible traces of nuts.